It's time for another Kid Picks carnival over at 5 Minutes for Books. My son is 2 and has a different favorite book every day. Since that's the case, I'll pick my favorite of his more recent favorites and highlight that one. 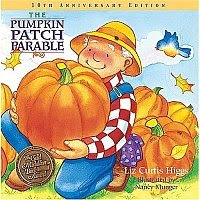 We've been reading The Pumpkin Patch Parable by Liz Curtis Higgs during lunch time in preparation for our family trip to the pumpkin patch. Our family doesn't celebrate Halloween (we'd rather focus on the fact that it's also Reformation Day) and so I find it somewhat difficult to locate books that don't have to do with ghosts, etc. I don't mind jack-o-lanters at all. I just prefer that they look non-threatening. The Pumpkin Patch Parable fills our little niche perfectly. It combines the facts about how pumpkins grow with a spiritual lesson that although we might be "slimy" on the inside, God can take our inside, clean it out and create something beautiful. It's a good lesson for adults as well as children. We read this book in preparation for our visit to the pumpkin patch so that we'd have some idea of what to expect. We ended up going to this big family farm that boasted a pirate ship made out of hay bales, a petting zoo, a corn maze, a children's playground, a giant apple/pumpkin slingshot "and much, much, more!" The place was a festival in the truest sense of the word. However, our son's absolute favorite thing to do was wander around in the pumpkin patch. He'd have been quite content if we'd just left him there, free to roam around and pick up pumpkins! I was glad to have had this book on hand for reading. We used it as a reference point as we walked around all the pumpkins and enjoyed our time at the patch. Excellent book in which we are well pleased. We're also well-pleased with the pumpkins we ended up bringing home! How fun! I love the apple/pumpkin slingshot. I've never seen that. That picture is adorable and the book sounds very cool! This sounds great! I'll have to check it out . . . Thanks! Hi there. I just posted my first Kids' Picks post tonight. My daughter is 2 as well but we celebrate Halloween so you probably won't be interested in the Halloween book I mention. However I've reviewed 3 other books you might like. These parable books are great. we have not read the pumpkin patch parable...think we need to. I love the picture of your kiddo with that huge pumpkin. How fun! How fun! This looks like a great book...I'm going to have to look for it. We don't do Halloween either. To me, it's just a hassle. Not to mention just plain weird. Cemeteries as decoration? I rest my case.